The first pool we fished seemed promising, but we could not muster a grab from any of the possible fish that may have been in the spot. We saw a few flashes, but nothing would make the Thingamabobber take a downward dive. The water temperature was right around 40 degrees, and I was confident that if it would raise a couple of degrees we could have some good action. They were fishing hard, thorough, and they were picking up the techniques and tactics very well; so it was just a matter of the inevitable. Now it was Will's turn to hopefully rope into something insane like that one. We fished one pool after and nothing happened as far as hookups or seeing any potential action. We went to the next spot, and I set up Will where I hooked a monster last Friday, and had a client two Mondays ago hook into a very huge fish. Will fished a few drifts through,and suddenly the Thingamabobber took a plunge. Will slammed the hooked into the corner of the fish's grill and it was game on! The fish gave a super deep sturdy battle and it seemed like it would never end. The standard big buck fight; where it just hunkers down in a fast current and wears you out. Will endured the battle, and eventually got the ocean fresh chrome bright buck to yield. It was a fish that measured at 34" long and was chrome as a dime. We admired this native beauty, and Will sent him back off into the chilly flows to continue his run upriver to this natal spawning grounds. We then went to the next spot, and it was Ken's turn to rope into some chrome. He took about three casts into the "hot zone",and he was into another chrome bright fish. It was looking like a "normal" sized steelhead, and we kind of joked how it looked small after the two previous fish. The fish fought very hard, and made some nice runs, and really put on a seriously long enduring fight. Ken steered the chrome bright native hen into the hoop of the rubber net, before we unhooked her, snapped a few pics, and sent her off into the mysterious green waters. I took the water temperature and it was now at 43 degrees; which was interesting to see how that lined up with more consistent action. 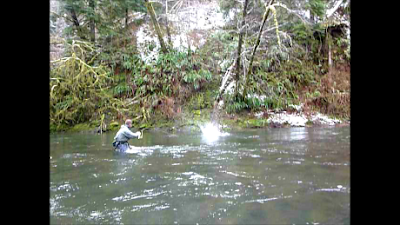 Winter steelhead or cannonball landing in the water? We fished a few more spots with no action, and then I decided to take them to another "honey hole". I was giving them a demonstration of where to fish the spot, and on my second cast of the demo, I got into a fish. I offered the hot fish off to one of the guys, but they insisted I kept the rod in my hand and wanted to see my fight the fish. I had a fun battle with the fish, as it ran through my fly line, and went deep in the back end of the long pool. I fought her all the way back in, only to have her zip the line away several more times. When I landed her, she was a gorgeous wild hen that was picture perfect and went about 7-8 pounds. I checked her beauty out, and sent her off into the steelhead green pool. What a day! I even got to catch a fish on my guide trip! I set the guys up in the spot, and within a few casts, Ken was on tight to another chromer. It fought well, and turned out to be a fin clipped hatchery fish; so we bonked it. Ken now had some fresh winter steelhead to bring home for the table on top of the wonderful native wild winter steelhead we got to experience. 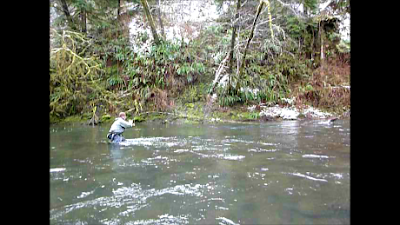 What a day we had out on the water to kick of March winter steelhead fly fishing. These native winter steelhead are something you have to experience! Get yourself out on the water!! I have a few openings for the remainder of winter steelhead season for guided trips; so if you are interested get a hold of me. You can email me at fish@mckenzieangler.com or you can call me by phone (541)-232-6360.